1 of 5 Heat oven to 350 F. Coat 13 x 9 x 2-inch baking pan with nonstick cooking spray. 2 of 5 In a large bowl, beat cake mix, oil, yogurt and eggs on low for 30 seconds. Increase speed to medium-high and beat for 2 minutes, scraping down the sides of the bowl after 1 minute. 3 of 5 Spoon batter into prepared pan and bake at 350 F for 35 minutes or until a toothpick inserted in the center comes out clean. Cool on wire rack for 15 minutes. Remove cake from pan and cool on rack completely. Trim off about 1 inch from edges and reserve for snacking. Cut cake into 1-inch cubes. 4 of 5 In a large bowl, beat heavy cream and rum extract until stiff peaks form. Gently fold in the marshmallow cream; fold in crushed pineapple with its juice. 5 of 5 Place half of the cake cubes in a 14- to 16-cup trifle dish; gently press to compact. 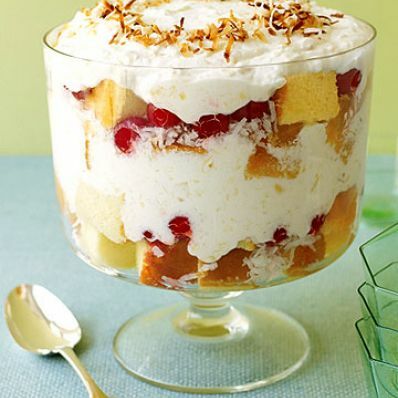 Sprinkle half of the coconut and scatter half of the cherries over cubes. Spoon half of the whipped cream mixture evenly over cubes. Repeat layering. Cover with plastic wrap; refrigerate for at least 3 hours. Garnish with toasted coconut, if desired, before serving.